A few weeks ago, most of the world recoiled in shock at a video showing the decapitation of American journalist James Foley by a terrorist group that calls itself the Islamic State of Iraq and Syria, or ISIS . More recently, ISIS put out another video titled “A Second Message to America,” showing the beheading of American journalist Steven Sotloff. And they promise more in the future. 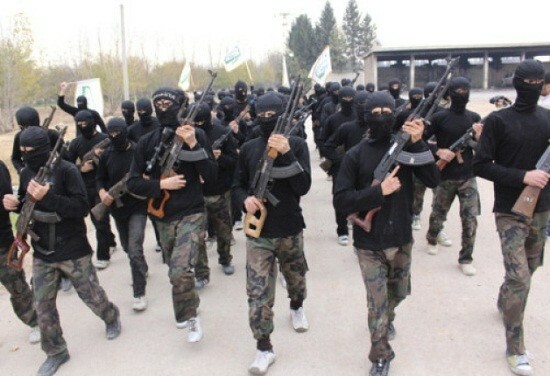 These images, along with many others, of these militants dressed in their black garb and using U.S. made arms, have had a profound effect on the West; especially here in the U.S. There are cries of outrage and demands that president Obama do whatever is necessary to eliminate ISIS forever more, including putting boots on the ground; to use a worn-out phrase. But that is not a strategy. That is revenge. We would be doing what ISIS wants – sending in more Americans to kill, thereby creating a propaganda tool to lure even more recruits to their ranks. However, there are the Chicken Little cries by some of our political leaders like Representative Mike Rogers, Chair of House Intelligence Committee, Senator Dianne Feinstein, chair of the Senate Intelligence Committee, and perpetual war mongers Senators John McCain, and his faithful companion, Lindsey Graham. They and others claim that ISIS is coming over here to do us great harm. But others contend there is no imminent threat, no clear and present danger, not now. But even if there were a threat to our security by these fanatics, or any other terrorist group for that matter, we are well prepared to deal with it. Consider that post-9/11, we have spent almost $4.4 trillion on security according to The Cost of War Project. This includes the $1.4 trillion we’ve spent on the Iraq and Afghanistan wars. 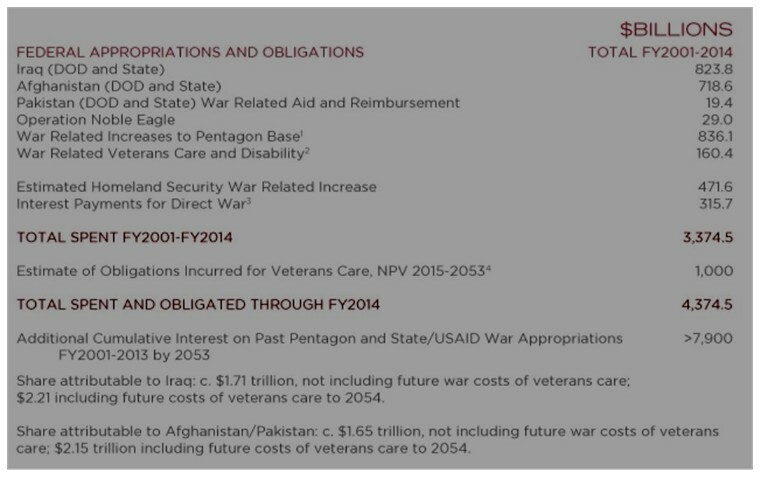 The rest of the cost includes the creation of the Department of Homeland Security with its 240,000 employees, the expansion of our 17 intelligence/spy agencies, and the care and treatment of the veterans of the two recent wars. And by the way, this doesn’t include the cost of the beefed up anti-terrorist operations incurred by state and local governments since 9/11. So, not to worry. Your government can easily protect us from terrorists . . . even though virtually all the cost was paid for with more national debt, which, in itself, is terror of another kind. With the homeland safely protected, the existential question now is how will we protect American interests in the Middle East? Our nation building efforts have been total failures. Therein lies the problem. Even if we do manage to eliminate ISIS, how long will it take them to regroup and emerge later as ISIS 2.0. 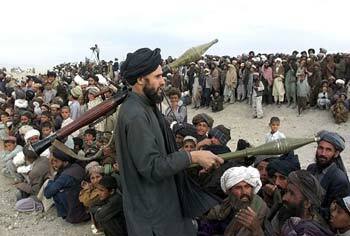 Then there is 2015, when we will have withdrawn from Afghanistan and must consider the possibility of a refreshed and determined Taliban and Al Qaeda 2.0 pouring out of Pakistan to reclaim what was theirs prior to 9/11. At the end of the day, it’s the Arab states that have the most to lose. Unless they get their respective acts together, terrorism will continue indefinitely. Libya is already a failed state, which has raised concerns by Algeria and Morocco. Iraq may soon follow suit. And trouble is brewing in Egypt and Pakistan, the latter being a state with nuclear bombs. To make matters worse, hatred of the U.S. by citizens of these countries continues to grow, thereby driving more and more malcontents into the terrorist group de jour. It’s at least worth pondering whether we should take a hands-off approach and let the people in that area sort it out for themselves. Maybe then we can stop the bleeding that comes from the blowback we created in the first place, and that we seemingly refuse to acknowledge. In any case, president Obama now finds himself in a no-win double bind; all decisions are bad. So, as is usual in these situations, it’s a search for the least worst decision. I’m just glad I don’t have to make it. This is a revised version of an Op-Ed by the Author that appeared in the Joplin Globe on September 9, 2014.